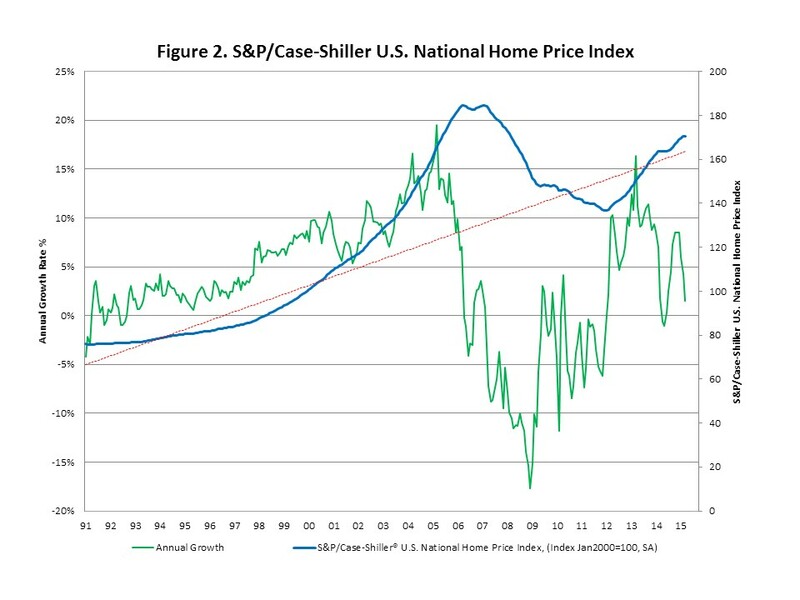 The Federal Housing Finance Agency (FHFA) and the Standard and Poor’s/Case-Shiller recently released the Home Price Index (HPI) for March. 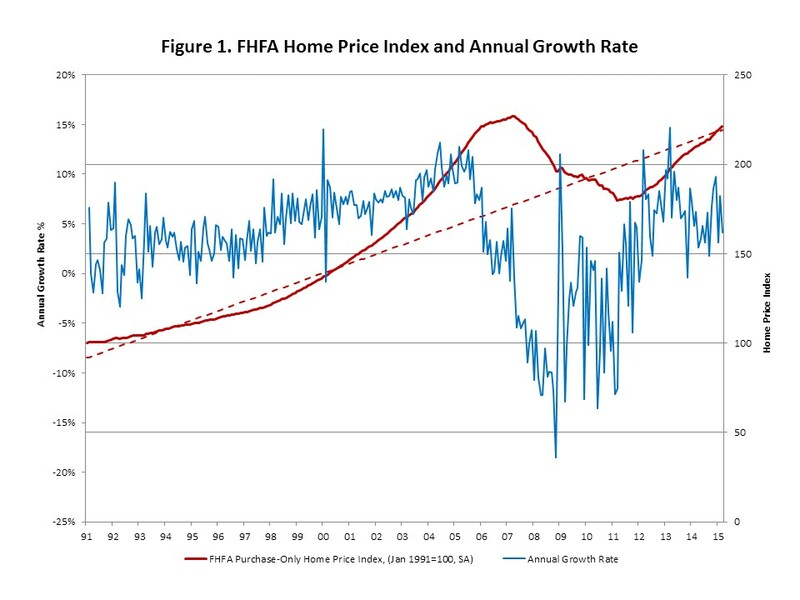 The price index reported by the Federal Housing Finance Agency (FHFA) decelerated in March, slowing to an annualized growth rate of 4.2% from 7.8% in February. Monthly growth rates have been volatile but have trended down since the recent peak in 2013. The level of the index remains below the housing boom peak but has recovered to a level consistent with trend growth prior to the boom and bust extremes. House price recovery has been a critical component of the broader housing sector recovery. The sharp decline in house prices reflected a collapse in demand which motivated a sharp decline in production (supply). Housing production hit bottom in early 2009 when prices declines were steepest. As price declines moderated through 2010 and 2011 housing starts remained depressed. 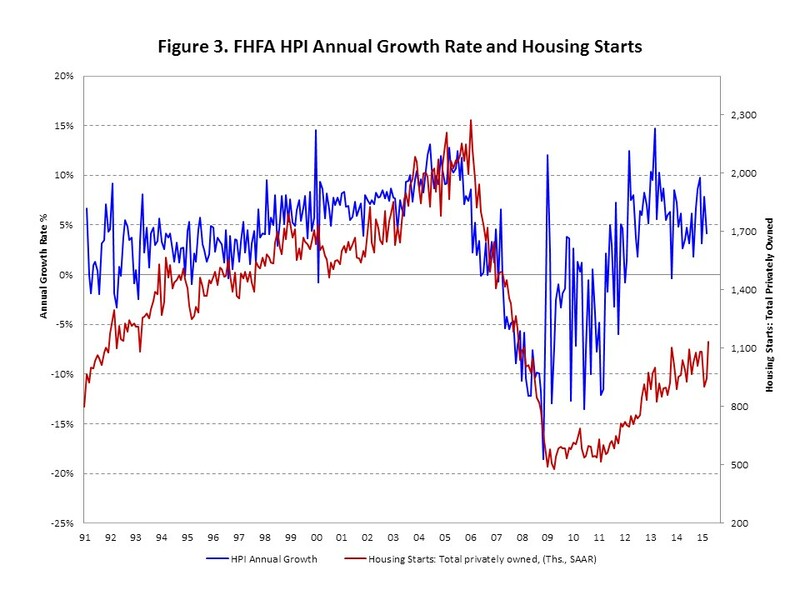 As price declines gave way to price increases in 2012 housing starts also began to recover. Total housing starts remain below the pre-boom level, but rising house prices reflect recovery in demand which will motivate continued recovery in supply and the return of a healthy housing sector. ‹ GDP Growth in the First Quarter – First Quarter Curse?